The Forest King " Lion " was shot hunter , jungle dwellers so restless . They do not have a king anymore . Not how the inhabitants of the jungle gathered to elect a new king . Was first nominated Leopard , but Leopard refused . " No, I 've seen people running helter-skelter , " he said . "Then Rhino course , you're very strong , " said the other animals . "No - no , not see well , I had hit a tree many times . " " Oh ... maybe Elephants are so King , you're a great body .. " , said the other animals . " I can not fight and my movement is very slow , " said the elephant . The animals become confused , they have not found a replacement king . When about to disperse , ape suddenly shouted , " Man who became king , he was not you who killed the Lion " . " No way , " replied the squirrel . " Try me ... you all noticed , I like men instead ? , Then I'm the one that fits into a king , " said the monkey . After going through negotiations , forest-dwelling apes agreed to be the new king . 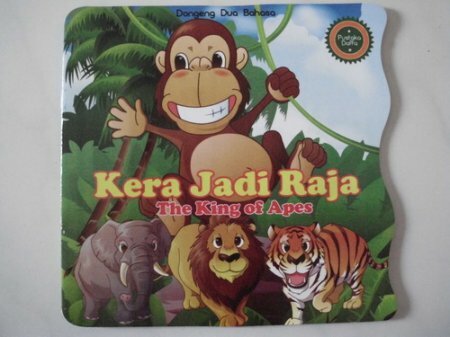 Once appointed king , monkey behavior is not at all like the King . It works just laze around while eating delicious food - delicious . Occupants animals become upset , especially wolves . Wolf thought , " how could the Ape man identifies himself with yes ? , His body just the same , but his brain is not " . Wolf got the idea . One day , he went ape . " My lord , I found the food very lezar , I sure would love my lord . Lord I will deliver to the place, " said the wolf . Without thinking , apes , the new king went with wolves . In the middle of the woods , sitting monkeys favorite fruits . Greedy ape directly attacking the fruit . Apparently, the Ape directly collapsing into the ground . Disergapnya food turns man-made trap . "Please ... please , " cried the ape , as he struggled to get out of the trap .
" Hahahaha ! Had never imagined , a king can act stupid , caught in traps set humans , like apes king which can protect its people , " said the wolf and other animals . Not long after the animals left the ape , a hunter came to that place . Seeing no monkey in it , he took his catch to the house . Moral message : Treat our friends well , do not be arrogant and lazy . If we are arrogant and treat friends badly, eventually we will lose them .